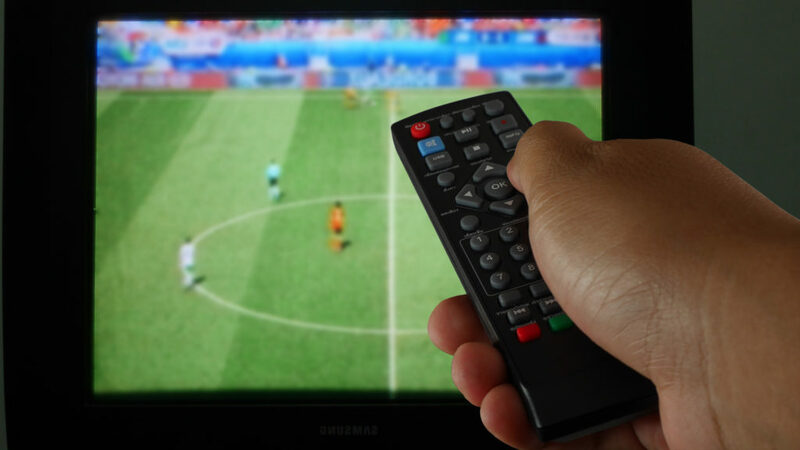 Thinking of buying a new TV for the summer’s biggest sporting event or the concert of the year? Then you should read Testfakta’s test first. One TV can’t handle the camera’s twists and turns and starts juddering. “Watching TV on it would be excruciating,” says the lab’s expert. An LED TV with 4K resolution could be a great option for those who want a TV with good picture quality that doesn’t cost an arm and a leg. But be careful which brand you choose – even TVs with the same technical specifications can be of very different quality. 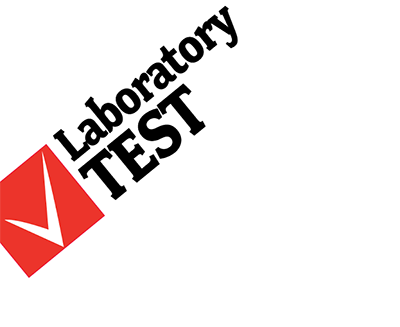 Testfakta has tested seven brands at Eurofins Digital’s laboratory in Linköping. The focus of the test was on picture quality, which involved the lab conducting technical measurements of factors such as colour reproduction, white balance and colour balance. An expert panel was also asked to visually assess the picture, plus the usability of the menus and remote control, and the sound from the built-in speakers. The TV from Samsung gets the highest grade overall. Samsung and LG tie on picture quality. 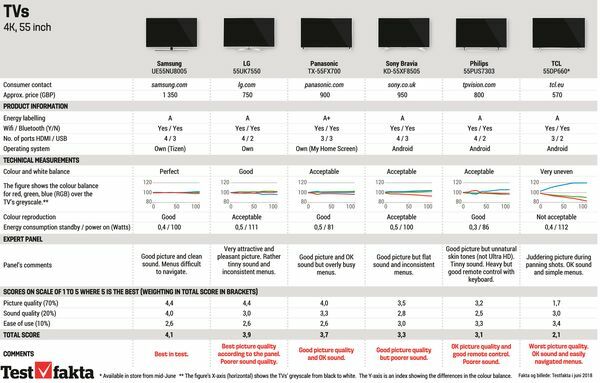 The Samsung TV performs best in the technical measurements, while the LG is the panel’s favourite. “Not everything can be measured, like movement for example, which is why both levels of testing are required,” explains Jerker Vingren, chief tester at Eurofins Digital. The worst grades in the test go to the TV from TCL, which has major problems with the picture juddering during panning shots. “Watching something on TV where the camera moves around a lot, such as football, would be excruciating,” says Jerker Vingren. The differences in picture quality are also clearly shown on the lab’s graphs for colour and white balance. While the better TVs manage to keep the colours evenly balanced, the TCL and the Andersson in particularly are way out. “For the viewer, this means that what you see on screen is not at all what was filmed. In these cases, the image is much bluer than in reality, with the red tones getting lost. It doesn’t look natural,” says Jerker Vingren. Having the description 4K means that the TV has a resolution of 3840 x 2160 pixels, and therefore has the potential to reproduce extremely fine details and colour variations, particularly if what you’re watching was also filmed in this Ultra High Definition. However, the pixel count is only one ingredient in the recipe for picture quality. The TV has several different components that need to work together to create a good picture. In addition, most films and TV programmes are still not recorded in 4K resolution, and that is something that some TVs handle better than others. The test panel watched the same clip in two resolutions. On the Philips TV, the skin tones were unnatural in the clip with the lower resolution (ordinary HD). One thing the otherwise poor offering from TCL actually did well on was how easy its menus are to navigate. This is an issue that more of the other TVs fell down on. In many cases, the menus are inconsistent and hard to find your way around. “It seems that this is not much of a priority area for the manufacturers. If you use a set-top box it doesn’t matter, because you’ll be using the menu system on the box. But for other users, the TV’s own menu system is important in determining how easy the TV is to use,” says Jerker Vingren. Testfakta commissioned Eurofins Digital to test seven different TVs from the 2018 range, 55 inches in size with 4K resolution and a maximum price of SEK 16,000. The selection is based on the Nordic market. The measuring equipment sends a particular programme to the TV, which is then displayed on the screen. A special camera films the TV screen and then measures how well what is shown on the screen matches the original. Three people from Eurofins Digital watched a range of film sequences on the TVs. The same film sequences were shown at the same time on an OLED screen that was being used as a reference. The panel also judged how well the TVs handled films of lower resolution. The same film sequence was shown in both UHD and HD. The sound from the TVs’ built-in speakers was also judged by the panel. When judging the picture and sound quality, the cinema/film preset or equivalent was selected on each TV. The panel judged how clear and easily navigated the menus were, along with the quality and usability of the accompanying remote control. The laboratory judged how easy it was to install the TVs, covering aspects such as channel searching, connecting to the internet and so on. The laboratory measured the TVs’ power consumption in standby and with power on. The measurement was taken over the course of one hour.